Yesterday I did a post about not coping and a huge thanks to those who have reached out with their prayers and support. I just got sick of hiding that I'm not coping and realised that in order to be honest with myself I need to be honest with everyone else. I know we go through seasons of hardship but it just feels like mine are going on forever and I can't see the light at the end of the tunnel. I guess all I can really do is keep praying and take it one day at a time until things get better. I have recently signed up to the website NetGalley that lets you request books for review so if you start to see a few book reviews around here that is why. I will say that all my reviews will be 100% honest and my hope is that you guys get to discover a new author or two and I will push myself out of my reading comfort zone at the same time. Moving onto Friday Favourites which are a bit random but that's just how my life is at the moment so it matches. Adam Sandler movies - I've been needing a laugh lately and nothing makes me laugh harder than an Adam Sandler movie. I know some people hate on him but his films really make me laugh and are a great distraction. I really like Grown Ups, Grown Ups 2 (it just gets funnier every time I watch it), Blended (Terry Crews singing really makes the film) and Just Go With It. I think everyone has those movies that they watch when they are down and these are mine. 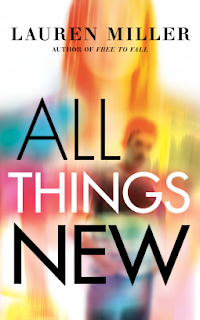 All Things New by Lauren Miller - This book is getting released in August and its a great read! I've struggled with finding a books with a character that has anxiety, it seems like the other mental illnesses are easier to represent in writing. Yet Lauren Miller manages to create a character that has anxiety in an accurate light and shows the inner workings that someone with anxiety may go through. I managed to relate to Jessa or more her thought process easily and was thrilled that someone could create a character that not only has anxiety but shows it accurately. Seventeen-year-old Jessa Gray has always felt broken inside, but she’s gotten very good at hiding it. No one at school knows about the panic attacks, the therapy that didn't help, the meds that haven’t worked. But when a severe accident leaves her with a brain injury and noticeable scars, Jessa’s efforts to convince the world that she’s okay finally crumble—now she looks as shattered as she feels. Fleeing from her old life in Los Angeles, Jessa moves to Colorado to live with her dad, but things go from bad to worse when she realizes she’s seeing bruises and scars on the people around her that no one else can see. She blames it on the accident, but as her body heals and the hallucinations continue, Jessa wonders if what she’s seeing could somehow have a deeper meaning. In her quest for answers, she falls for Marshall, a boy whose kindness and generous heart slowly draw Jessa out of her walled-off shell and into the broken, beautiful, real world—a place where souls get hurt just as badly as bodies, and we all need each other to heal. 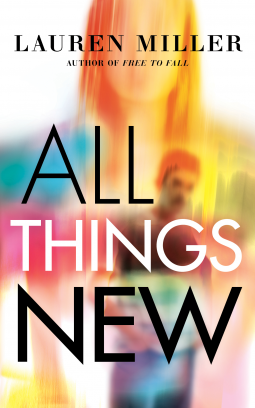 ALL THINGS NEW is a love story about perception and truth, physical and emotional pain, and the messy, complicated people we are behind the masks we put on for the world. I really enjoyed it and found that there was a lot more to this book than meets the surface. It was a fun read but was intense in some places, I never quite knew where the story was going and that was a plesant surprise. The main characters were great and the way they were shown means that you could easily compare Jessa's thought processes to them and see just how anxiety affects people. If you come across this book I highly recommend that you read it. Planet Shoes Town Boot - I hate getting my feet wet in winter so I mainly live in boots during the cooler months and I normally just buy a cheap pair because by the end of the season they are dead (as in I am gluing them together!) but this season I decided to treat myself to leather pair of boots. My Mum is a huge fan of Planet Shoes and these just so happened to be the first and only pair I tried on. They are super comfy and I love the height of the heel (not too high but it gives me a boost), they look and feel solid so I have high hopes for them this season. I have already worn them a few times and as the weather cools down I expect to be wearing them a lot more frequently. (I got them in black but I can only find stone on the website). SpyFall 2 - if you know you will know that I love playing board games, a great Saturday night for me is me playing boardgames with friends and we love to try new games. I recently discovered SpyFall 2 and we all love playing it. It involves a lot of talking and asking questions and is quick paced game too. You can play with up to 12 players which means it is ideal for a big group. The aim of the game is that everyone gets 1 card with either a spy (there can be up 2 spys per round) or location you have to ask eachother questions to work who the spys are and the spys have to workout where the location is. The first rounds can be a bit challenging but once you get the concept its really fun. Nutella Chocolate Chip Cookie recipe - I made these last week and I am still dreaming about them! This recipe is super easy and really yummy to make, the result is chewy chocolatey cookie that you can't just have one of. I increased the yum factor by chopping up a block of hazelnut chocolate which also meant the nuts added some crunch factor. In my books Bakerella can do no wrong so if you are after something to bake this weekend these are it.